While working on a date picker control I encountered a problem, where I was supposed to set year of the date picker control to a specific year. For this problem, I added a custom text box over date picker. When a user enters a year in that text box and clicks done button, I changed the year of date picker to the year provided in text box. Here is the piece of code, which I used to change year of my date picker control. 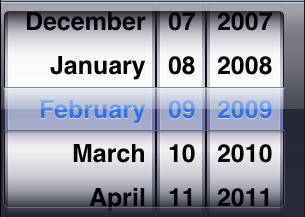 This logic can be used to change other components of the date picker with any year, month or date. components.year = [textField.text intValue]; // Here value for year is fetched from a text field control. Similarly other values like month, date, hour or minute can be changed. [calenderPicker setDate: [gregorian dateFromComponents:components] ]; // Update the date picker control. What the heck!… where is time in the picker ? given code sets year to the picker (components.year = [textField.text intValue];). Similarly you can set other components, like month, date and time.